A federal judge has given a group of renegade Downtown tenants the green light to keep living rent-free. The 17 residents of 533 Greenwich Street, a rundown former warehouse in Hudson Square, haven’t paid a penny in rent for 25 years. Now, thanks to a 1980s law that protects New Yorkers living in illegally converted buildings, they’ve been told they can stay in the $30 million building after it sells at an auction later this summer. Earlier this month, a federal judge ruled that the tenants could not be evicted or forced into buyouts as the building goes into foreclosure. They can’t be charged rent, either, unless the building undergoes substantial renovations, which the residents have resisted in the past. Protected by a provision of the state’s Multiple Dwelling Law, also known as the Loft Law, the tenants at the warehouse-turned-apartment building have maintained a rent strike since the early 90s, winning multiple lawsuits and frustrating several landlords along the way. Facing more than $12 million in tax liens and a Chapter 11 bankruptcy, the current owner, a holding company called Bridge Associates of SoHo, Inc., attempted to evict the residents from the property by arguing that they were holdover tenants who had not paid rent in decades and therefore had no legal standing to be in the building. Had the argument been accepted, the property could have been sold “free and clear” of any obligations to the residents and likely fetched a greater profit for the owner. However, like so many prior attempts to clear out the building, it failed. Judge Robert E. Grossman denied the company’s request, the first ever to use the bankruptcy code to challenge the Loft Law, citing similar decisions regarding rent-stabilized tenants. “The decisions out there now are that you can’t use the bankruptcy code to deprive rent stabilized and rent controlled tenants of their possessory rights,” said Slava Hazin, a partner with Warshaw Burstein, the law firm that represented the tenants. Bridge Associates also argued that the tenants should be legally compelled to accept a buyout offer. Grossman acknowledged that the residents could accept money in exchange for their rights to the building but were by no means required to. Roy J. Lester, the Long Island landlord representing the landlord, was not available for comment Monday morning. Known formally as article 7-C of the New York Multiple Dwelling Law, the Loft Law was devised in the 1980s to protect the growing number of renters occupying unsanctioned apartments in the city’s various defunct industrial zones. Little did the framers of that law know that some of those districts would one day be among the more desirable locales in the city. Such is the case with 533 Greenwich, a graffiti-strewn sore thumb in a neighborhood of newly-built apartments and freshly-renovated office buildings. 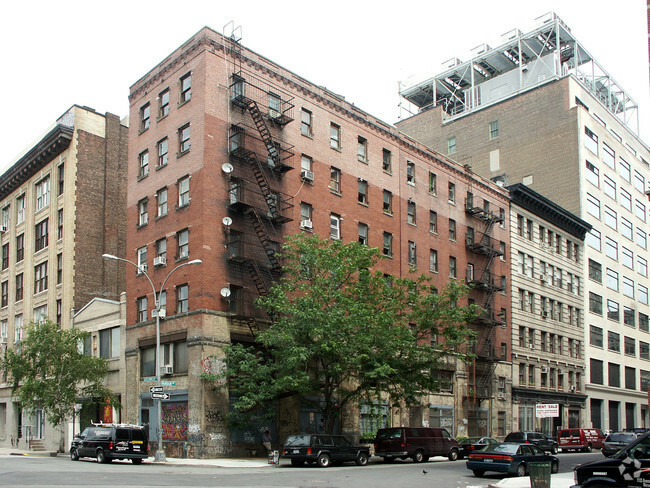 Also known as 99-103 Vandam Street, the building is 17,550 s/f on a 2,500 s/f lot. A 2013 rezoning of Hudson Square officially sanctioned the commercial property for residential use and paved the way for the structure to be expanded to 25,000 s/f as of right or 30,000 s/f if inclusionary housing is factored in, with a max floor area ratio of 12. A 2015 marketing campaign for the property included an asking price of $32.5 million if the building were delivered vacant. With tenants present, the “as is” asking price was dropped to $15.5 million. Under the Loft Law, landlords can operate in illegal conversions as long as they make their buildings comply with city codes. At 533 Greenwich, there is no certificate of occupancy so the owner can’t force the tenants to pay rent. To get certified, a broker familiar with the property said, the Bridge Associates of SoHo would have to address “major” code violations and structural concerns within the building. The broker said the residents have stymied these improvements, refusing to allow anyone hired by the landlord to enter the premises. An as-is buyer would have to either live with the non-rent-paying tenants, get them to agree to improvements that would bump the building into rent-stabilized compliance or negotiate buyouts with all of them. Hazin said his clients, some of whom are artists who’ve lived in the buildings since the 1980s, are willing to entertain buyout offers but he declined to comment on the sums they are seeking. When the building goes up for auction, which will likely take place in September, bids will start at $12.5 million, just enough to cover the owner’s tax debts. Bridge Associates of SoHo acquired the building in 2002, taking out a $1.2 million mortgage on the property, according to city records. The company subsequently ran up multimillion-dollar tax debts at the site, leading to the bankruptcy filing earlier this year. In 2005, before the zoning change, the property was assessed at $4 million, according to documents obtained by Real Estate Weekly, and it was briefly under contract for $6.6 million. Despite the untold thousands of dollars saved in unpaid rent, Hazin said the past few decades have been no walk in the park for his clients, as their building changed hands among landlords who put no money into legalize or even improving the space.